Florida cardiologist, entrepreneur and philanthropist Dr. Kiran Patel receiving the Pravasi Bharatiya Samman from President Kovind in Varanasi on Wednesday. The awards were presented by Indian President Ram Nath Kovind at the 15th Pravasi Bharatiya Divas in Varanasi on Wednesday. Tampa entrepreneur and philanthropist Dr. Kiran C. Patel and IMF chief economist Gita Gopinath were among four Indian Americans conferred with the Pravasi Bharatiya Samman on Wednesday. The awards were presented by Indian President Ram Nath Kovind at the 15th Pravasi Bharatiya Divas in Varanasi, Uttar Pradesh, which concluded on Wednesday. Besides the four Indian Americans, 24 other prominent personalities from the Indian diaspora worldwide received the awards. In addition to Patel and Gopinath, Illinois-based scientist Chandra Shekhar Mishra and Michigan resident Gitesh Jayantilal Desai were also honored. Patel, who was born in Zambia and earned his medical degree from India, received the award in the Medical Science category. He and his wife, Dr. Pallavi Patel, have committed more than $250 million to various philanthropic causes, mainly in the areas of healthcare and education, in the past 15 months. In September 2017, the couple committed $200 million to the Nova Southeastern University in Florida. Last month, ground was broken in Temple Terrace, FL, for a new $20 million charter school, fully funded by Patel. Over the years, the Drs. Kiran and Pallavi Patel Family Foundation has also launched a number of healthcare and education initiatives in India and Zambia. Gopinath, who was appointed as the chief economist of the International Monetary Fund in 2018, received the honor in the “Academics and arts” category.” She is also the co-director of the International Finance and Macroeconomics program at the National Bureau of Economic Research and also economic advisor to chief minister of Kerala. Last year, she was also elected a fellow of the American Academy of Art and Science. The economist was not present to receive the award. Mishra, a senior scientist at Fermi National Accelerator Laboratory, in Batavia, Illinois, received the award for his accomplishments in science. Mishra is also the founding US technical coordinator of the US-India Strategic Interest Discovery Science Collaboration, which enables the development of high-intensity proton accelerator technologies for physics and nuclear energy applications. He did his PhD from University of South Carolina. Jambusar in Gujarat and did his MS from University of Baroda. He has also served as the president of Indian American Political Action Committee of Greater Houston. The three-day long Pravasi Divas ended on Wednesday. 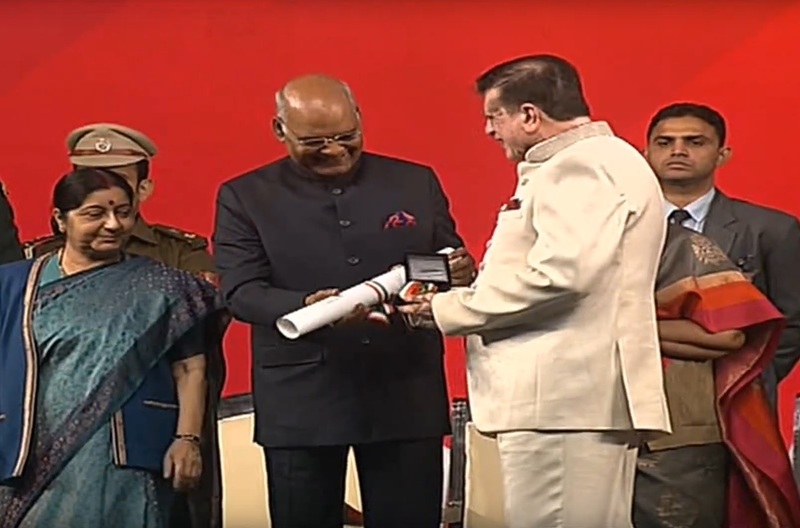 Apart from 28 individuals, there two organizations were honored with the Pravasi Bharatiya Samman, the highest honor conferred by the President of India as part of the Pravasi Bharatiya Divas Conventions. The organizations are the Guyana Hindu Dharmic Sabha and the Indian Community Association in Egypt. The other attendees at the concluding session of the event included External Affairs Minister Sushma Swaraj, Uttar Pradesh Chief Minister Yogi Adityanath, UP Governor Ram Naik, Uttarakhand Governor Baby Rani Maurya and Minister of State for External Affairs V.K. Singh and Mauritian Prime Minister Pravind Jugnauth. Other recipients of the award included Canada’s Ramesh Chotai, China’s Amit Waikar, Italy’s Bitthal Das Maheshwari, New Zealand’s Bhavdeep Singh Dhillon, Oman’s Vinodan Verambally Thazhikuniyil, UAE’s Girish Pant and Surender Singh Kandhari in the field of business. Kenya’s Prakash Madhavdas Heda (Medical Science), Kuwait’s Rajpal Tyagi (Architecture), Myanmar’s Banwarilal Satya Narayan Goenka (Business Management), and Poland’s Jagdeshwar Rao Maddukuri (Entrepreneurship) were also honored. Also others honored with the PBSA were Australia’s Nihal Singh Agar (Social Work), Bhutan’s Rajinder Nath Khazanchi (Civil Engineering), France’s Malini Ranganathan (Academics and Arts), Jamaica’s Guna Sekhar Muppuri (Medical and Entrepreneurship), Kenya’s P V Sambasiva Rao (Technology). A total of 7,228 people from 90 countries registered for this year’s event, which was inaugurated by Indian Prime Minister Narendra Modi on January 22.